I suppose most of us, having read the standard references, know that HMS Sirius started life as HMS Berwick. I certainly had only that information. The publication the Sirius, Past and Present by Graeme Henderson and Myra Stanbury, published by Collins Australia, Chapter 2, Building and Outfitting the Berwick, is a fascinating account, telling the story of this early life of HMS Sirius, as well as a general study of shipping of the period. There is considerable detailed information about the ship’s construction. I have not covered it here. If interested, you may consult your library. Built for the Baltic trade in 1780-81, the Berwick was purchased by the British Navy prior to completion and fitted out as an armed storeship. …brought the following anecdote respecting the Ship to light. She was…intended for an East country man but in loading she took fire and was burnt to her wales…the navy board purchased the bottom of the Ship, she was taken into dock and ran up with the refuse of the yard. Originally she (Sirius) had been built for the East India Company. So note the two points which the authors must deal with. This ship was originally called the Berwick and intended for the East India Company; but having, while on the stock, met with some accident by fire, was purchased b y the Government for a store-ship. No anecdote here – just a bald statement. However, when we recall the close relationship between King and Collins, maybe they are both retelling the same conversation. The authors set out to establish the truth. In the eighteenth century, the term East country referred particularly to the region of the Baltic. In shipbuilding, East country plank meant Baltic oak or elm. There is no record of the Berwick with the East India Company. Indeed, she is wrong for an East Indiaman – her design is in line with the Baltic traders. Secondly, the question of damage. The letterbooks of the Deptford Royal Shipyard contain nothing to sustain the story. Before purchase, she was carefully surveyed by Deptford officers prior to purchase and their report has no mention of fire damage. The authors then proceed on the basis that this is merely a mariner’s tale. The Berwick was built at Rotherhithe, a shipbuilding village on the Thames adjacent to Deptford. Large ocean-going ships of a high standard were built there. The Mayflower sailed to America from Rotherhithe in 1620. First mention of the Berwick was in 1781 when officers from Deptford inspected her on the stocks. 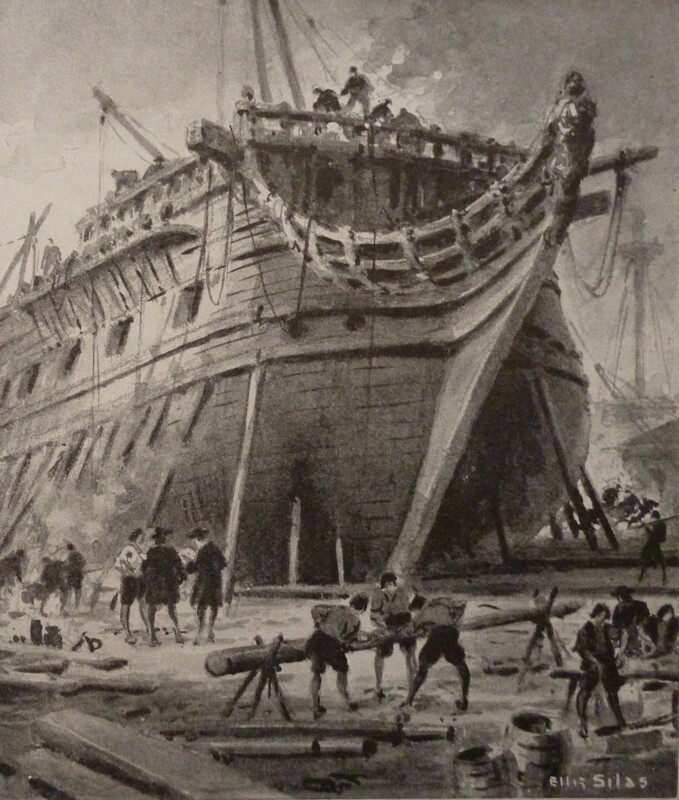 The builder, Watson, was probably the same builder as the builder of Prince of Wales, launched in 1786, just in time to be added to the First Fleet. Deptford, a royal dockyard, was under the control of the Navy Board. Transports tendered for charter to the Government were surveyed. The Navy Board’s shipping needs were made known by advertising, word of mouth and notices in public places. Any ship tendered received the most thorough survey. The Berwick’s keel length to beam ratio was 3.0:1, equal of the Endeavour, the Resolution and the Bounty. By contrast, the East Indiamen were longer and narrower; Chapman’s East Indiaman, for example was 3.6:1. The vessel was purchased for £11.10s (pounds, shillings) per ton, compared with £14.4s for an East Indiaman and £10.15s for the Pandora, a high price at the time. The Navy had paid a substantial price for the Berwick and intended her to be a quality vessel. There is no evidence to support the claim that she was a burnt wreck run up with shipyard waste. She made two trips to the Americas before being fitted out and renamed after Sirius, the bright star in the Southern constellation of the Great Dog. A new name – a new destiny in leading the First Fleet safely on its journey to posterity. The Sirius was built in 1780 for the East India trade, and named the Berwick, but having caught fire was purchased by the Admiralty in 1781, repaired and used as a store-ship. She made two voyages to the West Indies, and was then laid up until required in 1787 for a voyage to New South Wales as guard ship to the first convict transports, and was re-named Sirius. An upper deck, or spar deck, was built over her main deck from fore masts to poop, so that she was flush-decked fore and aft, with a rail completely around this upper deck. Her guns, being carried on her main deck, were thus somewhat higher than would have been the case had she originally been built with a gun deck. She was staunchly built of teak, but her upper part was repaired after the fire with inferior timber, which, with the upper deck, leaked badly later on. The bottom was sheathed with copper, and the hull was painted bright yellow, with a broad black band near the waterline. Her burthen was 612 tons, extreme length from figurehead to stern about 142 feet, breadth 32 feet, depth from keel to upper deck 26 feet. The only authentic pictures of the Sirius which are known are a dozen beautiful small watercolour sketches by her first Lieutenant, William Bradley, drawn at various intervals during the voyage, and contained in his journal, now in possession of the Mitchell Library. 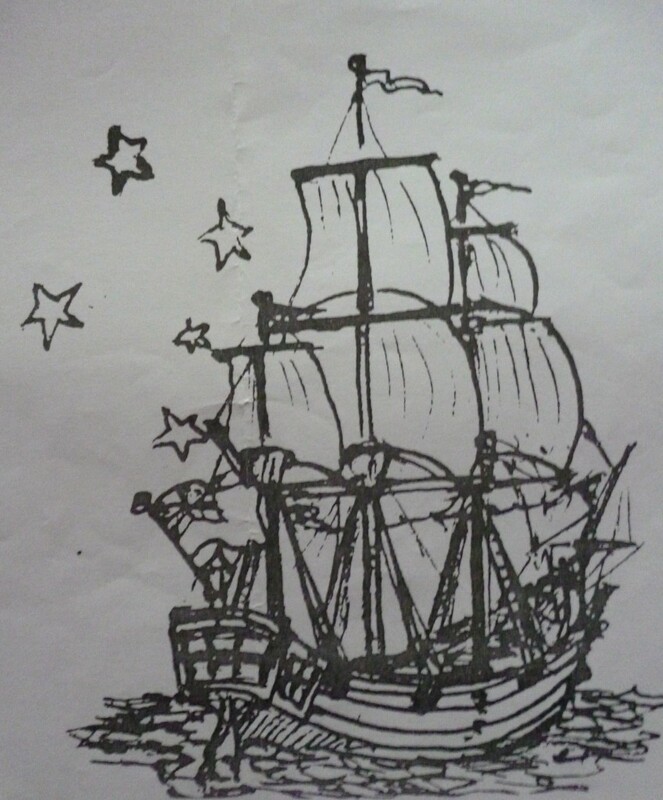 Great assistance has been obtained from these sketches for the drawing the dimensional sketch, which appears elsewhere in this issue; further dimensions of ship and spars have been calculated from contemporary dockyard rules. The Sirius was classed as a sixth-rater and her armament consisted of four six-pound guns and six carronades, but at Phillip’s request 10 more guns were added, so that generally she is said to have carried 20 guns. However, these additional guns were stored away in the hold. Her gun deck was so cumbered with stores that it was not possible for a salute to be fired on arrival at Santa Cruz when lying in Table Bay, eight of her guns were taken from the gun-deck and also stowed in the hold, in order to make room for cattle stalls, which were constructed, taking up all the space on her gun-deck. Therefore, on arrival in Port Jackson, she would only have two guns mounted in position. The first mentioned 10 guns were landed in Sydney, and place in a small fort built on the east side of Sydney Cove in 1788; and the latter eight guns were landed and placed in a fort at Dawes Point later on in the same year. Her rig was the ordinary one for vessels of her class, three square sails on each of the fore and main masts, and only one on the mizzen. She did not carry royals, the long spare pole above the top-gallant masts being merely a flagpole, by no means strong enough to carry a sail, and royal yards, sails, and rigging were not supplied. 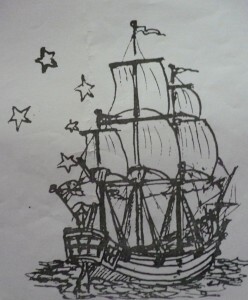 The sails shown in the sketch were those which were set as the Sirius slowly sailed up Port Jackson piloting in the First Fleet, and are in accordance with Lieutenant Bradley’s sketch of the fleet in Port Jackson on January 26, 1788. The Sirius sailed under the Red Ensign, as was the regulation of all of his Majesty’s vessels when not under the command of a flag officer of the White, or the Blue, and also carried a small Union flag on the jackstaff on the bowsprit. 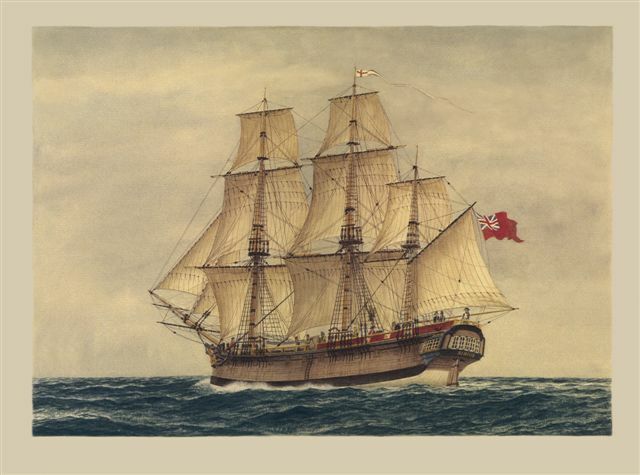 When Captain Phillip was aboard he flew a broad red pennant at the main as commodore of the expedition, but when he left the Sirius to try to push ahead of the fleet in the Supply, soon after leaving Cape-town on 23rd November 1787, Captain Hunter then being in sole command, flew the ordinary very long pennant carrying a red St George’s Cross, with red, white and blue stripes longitudinally throughout its length. The Sirius carried four boats on deck, the modern davit which hangs a boat outside not then being customary. Her speed in favourable weather was the usual 7 to 8 miles per hour, and Phillip in the Supply only arrived in Botany Bay two days ahead of her and her convoy. She was very well found with the best of Admiralty dockyard stores, and very well manned with a crew of 160 men under most able officers, so that it is probable that when she entered Port Jackson there would not be a more speck and span vessel in the navy, for she had had an essentially fine weather voyage and spent a month at Rio de Janeiro and another month in Table Bay. Her first lieutenant, Bradley, was also a first-class surveyor, and with Captain Hunter made the first survey of Port Jackson. 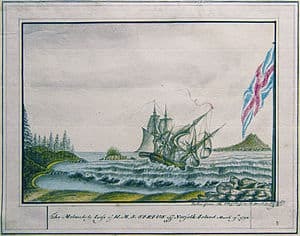 In his journal water-colour sketches show the Sirius and First Fleet at Santa Cruz, Rio de Janeiro, Table Bay, Botany Bay, and arriving at Port Jackson, besides several others off Norfolk Isle and Cape Horn, these being the only reliable pictures of her which are known to exist. Her second Lieutenant was P.G. King, who was soon placed in charge of Norfolk Island, and later on was Governor of New South Wales. Her third Lieutenant, G.W. Maxwell, had to be invalided home. The fleet left Spithead with HM Brig Supply, of 170 tons, and nine transports and store-ships, on 14th May 1787, spent eight days at Santa Cruz, one month at Rio de Janeiro, another month in Table Bay; arrived in Botany Bay on 20th January 1788, and in Port Jackson on 26th January under the command of Captain Hunter, for Phillip had proceeded them in the Supply, so was not aboard the Sirius as she piloted the fleet into Sydney Cove. The Supply was the first small sailing vessel to enter this port, and the Sirius was the first ship. Very great credit is due to Captain Hunter and to the various masters for safely piloting that fleet of nine weird old ships in and out of Botany Bay and up Port Jackson, for none of these transport masters had seen the port, so that it was strange and uncharted to them, and Hunter had only made a very cursory examination of it for a few hours. Each ship kept as close in line astern of the Sirius as was possible, and with a light to moderate easterly wind she led them through East channel, past Watson’s Bay, for it had considerably deeper water than West channel, and also this West channel would have placed the cumbersome old ships with a dead lee shore close aboard from Middle Head to Bradley’s Head. They began to pass through the Heads soon after 4 p.m., the Sirius made the signal ordering each ship to keep in her wake as closely as possible, and slowly proceeded under very easy sail, three topsails and the main top-gallant sails. By 5 hours 30 minutes p.m. the Sirius had moored in Sydney Cove and all the fleet were moored by 7 p.m. 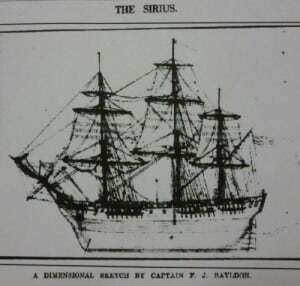 The Sirius remained in Port Jackson until October 2, 1788, when she left to fetch stores and provisions from Cape-town. She proceeded south of New Zealand, then to the eastward past Cape Horn, thus being the pioneer ship of this route, so well known in later years to homeward bound clipper ships. Lieutenant Bradley notes in his journal that they crossed the meridian of Greenwich in about 40 degrees south latitude on Christmas Day, and so, in order to bring their date in conformity with east longitude date, they duplicated December 25, and thus had two Christmas days, and as it was leap year 367 days in the one year, which he quaintly wonders whether any other navigator had done before. This is probably the first instance of navigators having altered their date when they were actually at sea, on account of crossing the first or 180th meridian, the usual custom having been to alter their date when they arrived at some civilised port. After loading at Capetown they left on February 20, 1789, and still continued sailing to the eastward to Port Jackson, where she arrived on May 9, having been the first vessel to completely circumnavigate the globe in the belt of westerly winds, so well known in later years as “The Roaring Forties”. She met with very heavy weather off the south coast of Tasmania, where she narrowly escaped being wrecked on April 22. Most excellent seamanship saved her, but she lost her figure-head of the Duke of Berwick, and sustained great damage forward in heavily thrashing off from a lee shore. To affect repairs she was careened in Sirius Cove, or Mosman Bay, and again left the port on March 7, 1790, with 400 marines and convicts and provisions for Norfolk Island in company with the Supply. She safely landed all the people on March 13 and 14, but had then to keep to seas on account of heavy weather until the 19th, when in moderate weather they hove-to off the settlement in Sydney Bay, on south side of the island to land provisions. Whilst loading the boats, the Sirius drifted too close inshore, and they were unable to beat out again either by tacking or wearing; they had no knowledge then that the foul ground extended as far from the shore as it really does and by leeway and sternway she was driven on to the shore reef in front of the settlement, and within a few minutes was a total wreck. Lieutenant Bradley gives coloured sketches of the ship trying to beat out, and another of the wreck, which is so similar to the larger picture in the British Museum, photographic copies of which are in the possession of Mr William Dixson, F.R.G.S., as to suggest that this picture is also by Bradley. On the 13th (of March 1790), at two o’clock in the morning, we made Norfolk Island, which I did not expect we should have done quite so soon, but the easterly current, which is commonly found here, had been strong. We brought to till day-light, and then as the wind was fresh from the south-west, I knew there could be no landing in Sydney-bay, where the settlement is fixed, on account of the high surf, which southerly wind occasion. I therefore bore away, and ran round to the north-east side of the island into a bay called Cascade-bay; where, after a few days of moderate weather, and an off shore wind, it is possible to land; but that only one spot, which is a rock that projects some distance into the sea, and has deep water to it. On that rock I landed, on the afternoon of the 13th, all the marines, and a considerable number of convicts, but being set to eastward in the night, I did not land the remainder until the 15th, when they were also put on shore in the same place. These people were no sooner on shore than the wind shifted to the eastward, and the weather became hazy and blew strong, so that I had no prospect of being able to land any part of the provisions. We had put on shore from the Sirius and Supply 270 people, and had no opportunity of sending stores to them, as we were now driven out of sight of the island. 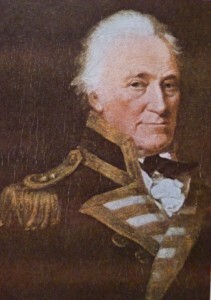 I knew the exhausted state of stores there; I was also acquainted with the many difficulties which Lt Ball, commander of the Supply, had met with in the previous voyages he had made from Port Jackson to this island with provisions; and the length of time he had, in some of these voyages, been obliged to cruise, before he could have any access to the shore; so continually does the surf break around it. These considerations gave m much anxiety and uneasiness. On the 19th, a slant wind from the south-east brought me again in with the island. The Supply had the preceding night parted company, but as they were better acquainted here than we were, I judged they had stood closer for the island in the night before I did. As we stood in, finding we could fetch the windward part of the island, I steered in for Sydney-bay; and as we drew near I observed the Supply lying to in the bay, and the signal upon the shore was flying, that long-boats, or any other boats might land, without any danger from the surf. Anxious to avail myself of this favourable signal, I steered in as far as I judged safe, and brought to with the ships head off shore, in the south-east or wind-ward part of the bay, hoisted out the boats, loaded them with provisions, and sent them in; but observing that the ship settled fast to lee-ward, we made sail and immediately hauled on board the fore and main tacks. The Supply had also made sail, and was to lee-ward of the Sirius. There is a reef of sunken rocks, which lies off the west point of the bay, and which (as the wind freshened and the sea rose) broke a considerable way out. The Supply having drawn ahead, could not weather the reef; on this she tacked; and, as we drew near, I plainly perceived that we settled so fast to lee-ward that we should not be able to weather it; so, after standing as near as was safe, we put the ship in stays; she came up almost head to wind, but the wind just at that critical moment baffled her, and she fell off again. Nothing could now be done, but to wear her round in as little room as possible, which was done, and the wind hauled upon the other tack, with every sail set as before; but still perceiving that the ship settled in the bay, and that she shoaled the water, some hands were placed by one of the bower anchors, in five fathoms of water. The helm was again put down, and she had now some additional after-sail, which I had no doubt would ensure her coming about. She came up almost head to wind, and there hung some time; but by her sails being all a-back, had fresh stern way; the anchor was therefore cut away, and all the haulyards, sheets, and tacks let go, but before the cable could be brought to check her, she struck upon a reef of coral rocks which lies parallel to the shore, and in a few strokes was bulged. When the carpenter reported to me that the water flowed fast into the hold, I ordered the masts to be cut away, which was immediately done. There was some chance, when the ship was lightened of this weight, that by the surges of the sea, which was very heavy, she might be thrown so far in up the reef, as to afford some prospect of saving the lives of those on board, if she should prove strong enough to bear the shocks she received from every sea. It was now about 11 o’clock in the fore noon, and after the masts were gone, all hands were employed in getting out of the hold such provisions as could be come at, and securing them upon the gun deck, that they might be at hand in case any opportunity offered of floating them on shore. In the evening the wind freshened still more, and the surf was considerably increased; in consequence of which, it was strongly recommended by the gentlemen on shore, who knew the place much better than we could, that every person should quit the ship. For this purpose the end of a small rope was floated through the surf, and over the reef, to the shore, by an empty cask; and by that rope a seven inch hawser was hauled on shore, with a wooden heart upon it for a traveller, and the end made fast to a tree. By this traveller, I corresponded with those on shore, and received their opinions. To the traveller three or four sailors at a time were made fast, and were hauled by the people on shore through the surf, and over the ragged reef to the land; another part this evening, and the remainder the next day. The whole crew were intended to have been landed that night, but when it became dark the hauling rope of the traveller tot often foul of the rocks, which might have occasioned the drowning of those who were at such a time on the traveller: for the long scope of the hawser (nearly the length of two hawsers) by the weight of three or four people, was more than two thirds of the way in the surf and the men on it under water. The second day after the landing of the crew, the weather being more moderate, and the surf less dangerous, a few of the seamen, who could depend, in case of accident, upon their good swimming, were got on board by the hawser, and the utmost exertion used to get some part of the provisions sent on shore; but it was the fifth day before any could be landed. We were now upon this little island 506 souls, upon half allowance of provisions; and that could, without present numbers, last but a very short time, as the supply intended for the island was yet on board the Sirius; and consequently its safety very uncertain. Eventually most of the provisions, but very few of the personal items, were recovered from the wreck. It was eleven months before the Supply returned with provisions and took the officers and seamen of the Sirius back to Port Jackson, and the people on the island during this time would have starved except for the discovery of ‘Mutton Birds’ [known as the ‘Bird of Providence’]on Mount Pitt. 170,000 of these birds were eaten between March and August 1790. April 1790: The governor determined to go down to the harbour and I begged permission to accompany him. Having turned a point about halfway down, we were surprised to see a boat which was known to belong to the Supply rowing towards us. On nearer approach I saw Captain Ball make an extraordinary motion with his hand, which too plainly indicated that something disastrous had happened; and I could not help turning to the governor, near whom I sat, and saying “Sir prepare yourself for bad news”. A few minutes changed doubt into certainty; and to our unspeakable consternation we learned that the Sirius had been wrecked on Norfolk Island on the 19th February. Happily, however, Captain Hunter and every other person belonging to her were saved. Dismay was painted on every countenance when the tidings were proclaimed at Sydney. The most distracting apprehensions were entertained. All hopes were now concentred in the little Supply. 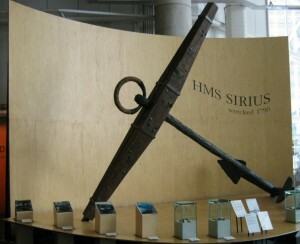 The anchor of HMS Sirius has been recovered. The Sirius was the flag-ship of Captain Phillip, who commanded the first English fleet to arrive at Botany Bay. She was wrecked on a reef in Sydney Bay, Norfolk Island, on March 19, 1790, so that the anchor of this pioneer ship has been recovered after a lapse of 115 years. The top of the anchor had been visible at very low water, and was one of the principal objects of attraction to tourists. It was recovered from the rock by blasting, and it is intended to bring the relic to Sydney. Last night a relic of considerable historic interest to Australians in the shape of the anchor of HMS Sirius, the flagship of Captain Phillip, who commanded the first fleet, was brought to Sydney from Norfolk Island by the streamer Induna, of Messrs Burns, Philp, and Co’s fleet. The anchor, which weighs about 1½ ton, and is of a very old-fashioned character, is carefully protected on the deck of the Induna. The steamer arrived here too late last evening to pass the health authorities, and anchored for the night in Watson’s Bay. This morning, upon being granted pratique, the Induna will be berthed at the Federal Wharf, and the valuable relic will be at once removed to a place of security, pending arrangements being completed for a permanent resting place – probably at the base of Captain Phillip’s statue on the Botanic Gardens. It was on May 13, 1787, that Captain Phillip, having hoisted his flag on board the Sirius as commodore of the squadron, gave the signal to weigh anchor, and the ships under his command, one after another, spread their sails to the wind on their long journey to found a new settlement in Australia. Calls were made at Santa Cruz, Rio de Janeiro, and Table Bay, and shortly after leaving the Supply, with the intention of arriving early at the scene of operations. Captain Hunter, the second in command of the fleet, then assumed charge of the Sirius, and arrived at Botany Bay with the storeships and transports on January 20, 1788. The last fatal voyage of the Sirius was commenced from Sydney on March 6, 1790. She was despatched, in command of Captain Hunter, to Norfolk Island, with Major Ross and two companies of marines and about 200 convicts, and arrived off the island on the 16th of that month. The anchorage as by no means a good one but the passengers were safely landed by means of surfboats. The Sirius remained off the settlement awaiting an opportunity to land her stores, but on March 19 she was carried by the currents on to the reef, where she shortly afterwards went to pieces. Referring to the life-saving operations, the officer’s narrative continued: – “The passengers fortunately landed before the accident, and I will just mention to you the method by which the crew were saved. When they found that the ship was ruined and giving away upon the beam right athwart they made a rope fast to a drift buoy, which by the surf was driven on shore. By this a stout hawser was conveyed, and those shore made it fast on a good way up a pine tree, the other end being aboard was hove taut. On the hawser was placed the heart of a stay (a piece of wood with a hole through it), and to this a grating was flung, after the manner of a pair of scales. Two lines were made fast on either side of the heart – one to haul it on shore, the other to return it on board. On this kind of frame the shipwrecked seated themselves, two or more at a time, and thus were dragged on shore through a sad dashing surf, which broke frequently over their heads, keeping them a considerable time under water. Some of them on coming on shore were half-drowned and a good deal bruised. Captain Hunter was considerably hurt, and with repeated seas knocked off the grating insomuch that all lookers-on feared greatly for his letting go, but got on shore safe, and his hurts are by no means dangerous. Many private effects were saved by the seas driving them on shore when thrown overboard, but it was not always so courteous. Much is lost, and many escaped with nothing more than they stood in. But for this ill-hap it was intended to have sent the Sirius to China immediately on her return for provisions”. In regard to the recovery of the anchor of HMS Sirius the flagship of Captain Phillip, the first Governor of New South Wales, who founded that colony, and commanded the first fleet that arrived in Sydney, Sir Francis Suttor points out that, taking a great interest in everything relating to the early days of the colony, and being anxious to regain this most valuable relic of the early history of Australia, he some months ago wrote to Captain Drake, R.N., the chief magistrate of Norfolk Island, and asked him if he thought it possible to recover the anchor from the bottom of the sea, where it was lying embedded in the rocks, informing him at the same time that he would willingly pay all the expenses necessary in connection with the recovery. In reply, Sir Francis was promised that on the first favourable opportunity every endeavour would be made to secure the anchor. On Saturday last Sir Francis Suttor received the following letter from Captain Drake: – “The Sirius anchor has been recovered, and now lies in the boat harbour at Kingston pending shipment. The salving has not been too easy a job with whalers, and a never-smooth sea, as it must weigh 20 to 30cwt or more, and was firmly fixed in the reef, which had to be blasted away. About 14 men have been employed at it, and I think that the work, including the shipment, should be worth £20. The anchor was a large one, and sufficiently old-fashioned to be almost a curiosity in itself. I shall keep it where it is, until I hear further from you, and if you wish it shipped it would be well to advise the captain of the steamer before he leaves Sydney. Of course, we must have fair weather for shipping it. We have just had good rains here, after nearly nine months’ drought, which bid fair to dry us out of the island. Messrs Burns, Philp and Co., with their usual liberality have been good enough to offer to bring the anchor, free of charge to Sydney, and there is a probability of its arriving within a month of th e present time. Sir Francis trusts that the Government will be kind enough to accept the anchor, and that it will remain for all time the property of the state, and he doubts if any more appropriate place could be found for it than at the base of the statute erected to the memory of our first Governor Captain Phillip, whose name is so intimately associated with the ship, of which (says the Sydney Daily Telegraph) we have now this most interested relic. The anchor is located in Macquarie Place Sydney, with both palms missing. One of the palms is still on the wreck site and the other, placed in the Norfolk Island museum. The Sirius third anchor was raised in 1985 by the Sirius project team and was transferred to the Australian National Maritime Museum, Sydney. Announcing the listing at Sydney’s National Maritime Museum, Federal Environment Minister Tony Burke said the arrival of the First Fleet in 1788 was the most significant moment in the history of Australia.